The 2018 Melbourne Cup will take place on Tuesday 6th November 2018 at Flemington Racecourse at 3:00pm local time. The 24 horse Melbourne Cup field features some of the best staying horses from Australia and around the world vying for the lucrative $6 million prize pool. Read on for the latest Melbourne Cup news plus form guides, betting updates, the latest odds and more. Held each year on the first Tuesday of November, the Melbourne Cup is a real test of staying power. The Melbourne Cup is raced over a distance of 3200 metres, far longer than any other major event in the Melbourne Spring Racing Carnival, so it is certainly not a race that is easy to prepare for. Two miles is the traditional cup race distance and few races in Australia are still contested over these meters. Every year the Melbourne Cup captures the attention of race fans around the country and abroad. It has now become a truly international affair too with nearly half of the 2018 Melbourne Cup field being raiders trained outside of Australia and New Zealand. Each year the international raiders are well-fancied in the Melbourne Cup Odds as they are bred to go the distance. The 2018 Melbourne Cup will be run on Tuesday 6th November at 3pm local time. The Melbourne Cup odds are open nearly all year round on the likely stayers set to line-up in the ‘race that stops a nation’ on the first Tuesday of November. When looking for the best Melbourne Cup 2018 odds, it is best to start early when the first nominations for the race come out. 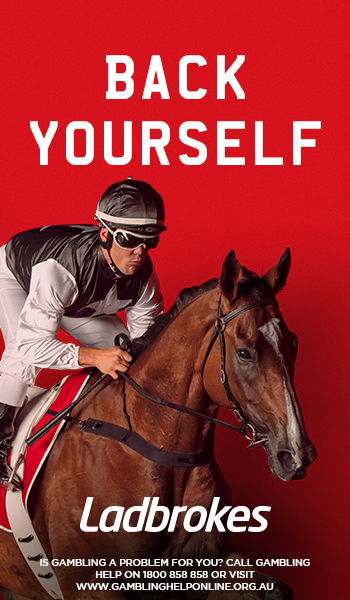 Online betting sites like Ladbrokes.com.au put out early markets on the Melbourne Cup nominations and you can lock in generous prices on your early Melbourne Cup tips in these all-in markets. If you prefer to leave your betting until later, then you can boost the lower Melbourne Cup odds you receive by taking exotic bets. The highest Melbourne Cup odds always entail an element of risk, but you will feel much better getting paid $1000 for a winning $5 bet than you would getting paid $6.50 just betting on a short Melbourne Cup favourite. Recent Melbourne Cup history shows favourites have a poor record with the last to salute for the punters at the shortest Melbourne Cup starting price since Makybe Diva (2005) being Fiorente (2013). The 2015 Melbourne Cup results showed that one of the longest-priced horses in that year’s Melbourne Cup odds was the one to back with Prince Of Penzance scoring an upset at $101. For more information on analysing the odds as well as the latest odds on the Melbourne Cup, please visit our dedicated Melbourne Cup odds page. The Melbourne Cup final acceptances close at 4:30pm (local time) on Saturday November 3, with the field made public and published below soon after. Already those in the know including the punters are predicting the likely Melbourne Cup field and keeping an eye on the updated Melbourne Cup ballot and order of entry is a good guide to what stayers will make the cut. The last chance for stayers to make the Melbourne Cup final field is Derby Day’s Group 3 Lexus Stakes (2500m). The last Melbourne Cup winner to back-up off a run in the Lexus Stakes only three days before was Shocking (2009) who completed the double. The Melbourne Cup field is restricted to 24 horses with no emergencies, but the race receives dozens more nominations in the lead up to the event. The final Melbourne Cup field for each year is released on the Saturday evening before the race, after the conclusion of Victoria Derby Day, and punters wait impatiently for this information each year as it allows them to lock in their final bets. Even still, many punters bide their time until the morning of the Melbourne Cup, just in case something gets scratched or odds improve. Following the release of the Melbourne Cup field on Victoria Derby Day, which kicks off the four-meeting Melbourne Cup Carnival each year, the Melbourne Cup barrier draw is then released live form Flemington Racecourse. The final acceptors then take their places at the track in three days’ time on Melbourne Cup Day for their shot at the major $3.6 million first prize on offer to the Melbourne Cup winner. Horses jump from the barriers at Flemington Racecourse in Melbourne. 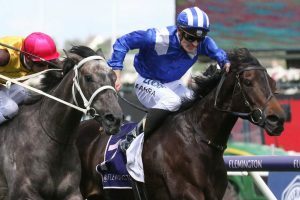 Some of these are overseas races, and the balloting exemptions provided by wins in these events have drawn many incredible foreign race horses to the Melbourne Cup field in recent years. 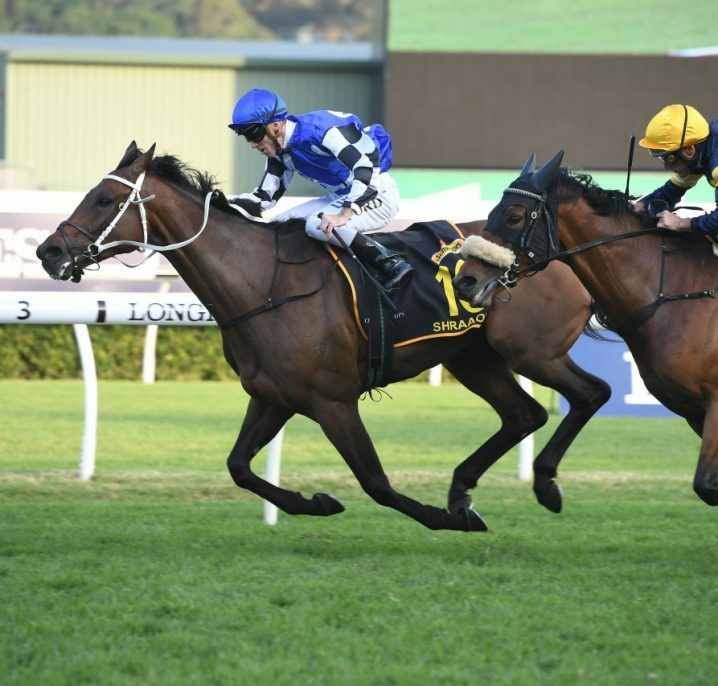 For larger foreign staying events the ballot exemption is more of an invitation extended to those talented horses to come and race in Australia’s most prestigious staying event. The Group 3 Lexus Stakes (2500m) runs at Flemington on Derby Day and offers a last chance for horses to sneak into the Melbourne Cup field. 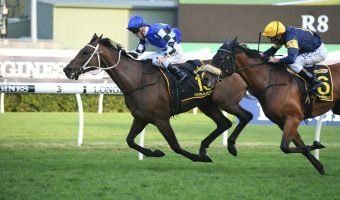 There is always a tense wait as the predicted Melbourne Cup field takes shape the Saturday before the classic with the winne of the Lexus Stakes capable of pushing out the horses sitting 24th on the Melbourne Cup ballot if they are further down the order of entry. Previously VRC Derby Day featured two races offering the winner a ballot free ride into the Melbourne Cup field. 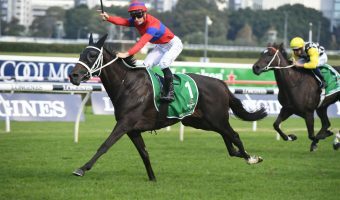 From 2016 however the old Mackinnon Stakes was moved to Emirates Stakes Day and run as the $2 million Group 1 Emirates Stakes (2000m), the weight-for-age clash no longer part of the Melbourne Cup lead-up. The winner of the Melbourne Cup is invited by the Japanese Racing Association to compete in the following Spring Tenno Sho in Japan, with many expenses covered. 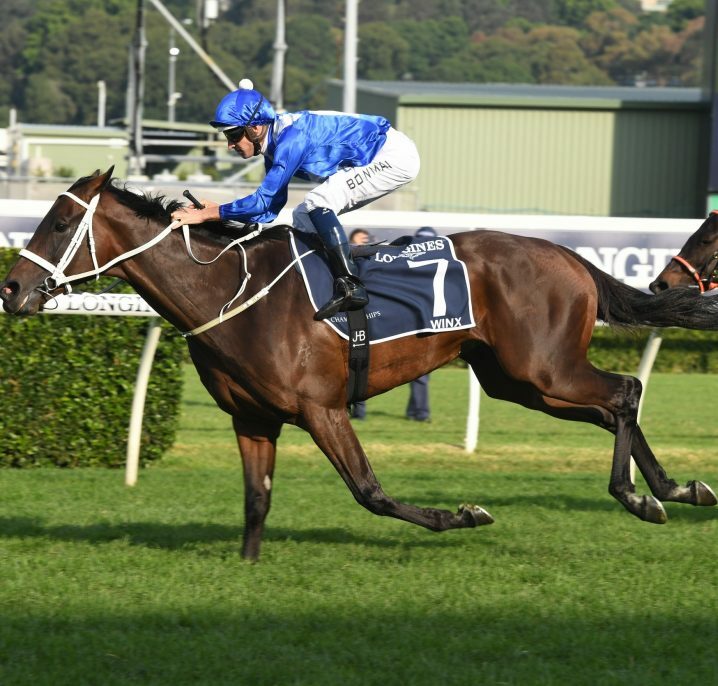 If a horse is a final acceptor but is subsequently balloted out of the final field, it will win a $100,000 bonus if it can win the Queen Elizabeth Stakes on Emirates Stakes Day. The link between the Melbourne Cup and Japan has been growing since the Japanese-trained stable mates Delta Blues and Pop Rock ran the Melbourne Cup quinella finishing first and second in the great race back in 2006. That was one year after the three year reign of the magnificent mare Makybe Diva ended following her victories in 2003 – 2005. Makybe Diva remains the only triple Melbourne Cup winner in history with jockey Glen Boss riding her to victory in all three of her successes. For the current race field and more on how it is decided, please visit our Melbourne Cup field page. Every year the Melbourne Cup runs at the same time, 3:00pm in Melbourne on the first Tuesday in November. Here are the start times for when the Melbourne Cup will jump around the country. Don’t miss out on the ‘race that stops a nation’ by checking the Melbourne Cup start time in your state. Wherever you are in the country, make sure you schedule a few minutes aside to watch the spectacle that is the Melbourne Cup. And don’t forget to head to a trusted Melbourne Cup betting agency like Ladbrokes.com.au to back your favourite to join the list of Melbourne Cup winners before race jumps! 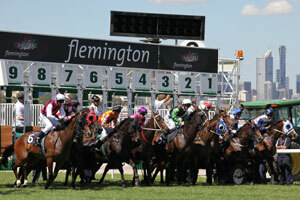 As well as holding the same start time, the Melbourne Cup race number remains the same each Cup Day – Flemington Race 7. Many people have their once-a-year bet on the Melbourne Cup results so when you want to place your bets, remember it is Flemington Race 7 at 3:00pm (AEDT) on the first Tuesday of November. Interestingly, the Melbourne Cup is the only Group 1 race on the Melbourne Cup Day schedule. There are still plenty of other exciting support races on the Melbourne Cup Day card so why not enjoy a full day of Melbourne Cup betting! There are more choices now than ever before when it comes to Melbourne Cup betting. Whether you are a once a year punter picking the Melbourne Cup winner based on a gut feeling or lucky number, a seasoned professional taking advantage of the generous Melbourne Cup odds available at the online bookmakers or you just pick a horse in your office Melbourne Cup sweep – there really is a way for everyone to get in on this iconic race. The Melbourne Cup second acceptances are the second round of declarations taken the Monday before the final field is released on the Saturday before Melbourne Cup Day. 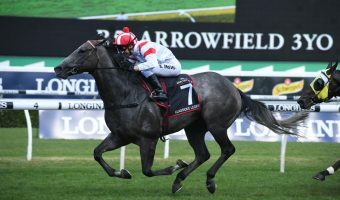 The Melbourne Cup second acceptances stage is the final step in the process before the announcement of the final field on Victoria Derby Day and traditionally attract around 30 – 40 hopefuls. View the official Melbourne Cup Second Acceptances 2018 on our Melbourne Cup field page. The 2018 Melbourne Cup Second Acceptances closed on Tuesday October 30 and attracted 47 stayers including 39 internationals led by Marmelo for the second straight year and Irish import Ventura Storm. Caulfield Cup winning roughie Best Solution heads the latest Melbourne Cup ballot, followed closely by last year’s Victoria Derby winner Ace High and Aidan O’Brien’s Irish hopeful The Cliffsofmoher. Read more on the official Melbourne Cup 2018 Second Acceptances. Melbourne Cup first acceptances are the first round of declarations helping narrow down the original bumper crop of nominees for the classic ahead of the official Melbourne Cup final field of 24 being released on the Saturday before Melbourne Cup Day. The 2018 Melbourne Cup first acceptances close in early October and can be viewed on our Melbourne Cup field page. The 2018 Melbourne Cup Nominations closed on the Thursday in late August at midday, along with those for the Caulfield Cup. The Melbourne Cup truly is a global event, and horses from the great racing nations from around the world make the long journey to Australia to participate. The enormous range of nations represented in the Melbourne Cup nominations include Japan, Great Britain, Germany, New Zealand, Ireland, France and the USA. Get a good look at the 2018 Melbourne Cup nominations, because the impressive amount of talent nominated for this year’s edition will surely make picking the winner a challenging task. Not long after, the Melbourne Cup weights are also released. First Declarations will be announced in early October. Second Declarations will occur in late October. The final Melbourne Cup field will be declared on Victoria Derby Day. Each year of Melbourne Cup nominations feature more international competitors than previous editions, the race being “internationalised” in 1993 when Dermot Weld won with Irish raider Vintage Crop. Vintage Crop remains the only international from over 60 who have tried to win the Melbourne Cup first-up without a previous run down under proving that even if a horse is bred for the distance, having previous form in Australia is key to their chances. The 2018 Melbourne Cup nominations and weights can also be viewed on the Melbourne Cup field page as soon as announced by Racing Victoria. The Melbourne Cup Barrier Draw will take place on Victoria Derby Day after the racing action on the Saturday before the Melbourne Cup runs on the first Tuesday of November. An interesting statistic that can affect betting is the 2018 Melbourne Cup barrier draw. While theoretically the distance of the race should make the Melbourne Cup barrier draw meaningless to the overall result, there have historically been a few barriers that have done particularly well and barriers that have performed poorly. Every year the Melbourne Cup barrier draw is conducted live from the home of the great race, Flemington Racecourse, which is Victoria’s premier race track. The Melbourne Cup barrier draw is an event in itself with the connections of the 24 horses engaged in the Melbourne Cup field invited up to select a gate for their runner to jump from the following Tuesday afternoon. Barrier 11 is historically the most successful Melbourne Cup barrier producing seven wins over the years. Other barriers with good numbers producing six winners each are five, 10 and 14. Barrier 18 meanwhile is yet to produce a Melbourne Cup winner since the current starting system was introduced in 1925. Most recently barrier five has been the best barrier producing back-to-back winners with Green Moon (2012) and Fiorente (2013). That said, the wider gates have not been a total disadvantage either with the three runners before that jumping from double figure barriers with Shocking (21 in 2009), Americain (11 in 2010), Dunaden (13 in 2011) and Protectionist (10 in 2014). To find out all about how the barrier draw can affect your betting, be sure to read our Melbourne Cup barrier draw page. Melbourne Cup tips are the most sought after set of racing predictions all year in Australia. 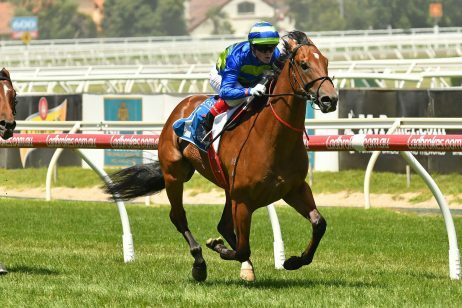 Early Melbourne Cup betting tips favour proven stayers that may have run in the previous year’s race or run well in the Group 1 Caulfield Cup (2400m). International raiders making the trip to Flemington Racecourse to line-up in the Melbourne Cup field are also popular when it comes to Melbourne Cup tipping each spring. The best Melbourne Cup tips can be found by following the link to our dedicated page. The Melbourne Cup form guide is a detailed run down of all the 24 horses making up that season’s Melbourne Cup field. In the form guide for the Melbourne Cup punters will find all the must know information including: Melbourne Cup saddlecloth numbers, Melbourne Cup barriers, Melbourne Cup jockeys, Melbourne Cup trainers, lead-up form, weights, record at the track / distance as well as the winning percentages of all the Melbourne Cup horses. Using the Melbourne Cup form guide and its facts / stats is the best way to predict the Melbourne Cup results. 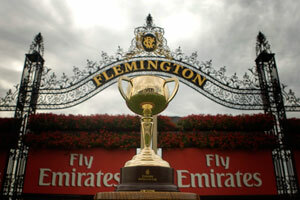 For the best Melbourne Cup form guide check out Ladbrokes.com.au and see our dedicated Melbourne Cup form guide page. Melbourne Cup history has been fascinating since the very first race in 1861, when Archer took the Melbourne Cup in a field of 17 horses. While Archer has the honour of being the first (and second) Melbourne Cup winner, he also retains the slowest time to date at 3:52.00. For years this was blamed on Archer travelling to the race by foot, but it has since been established that the legendary horse was transported by steam ship, so it appears the esteemed Melbourne Cup just wasn’t as competitive in the early days. It didn’t take long for the Melbourne Cup to become one of the most popular races in Australia, and many of the race’s longest standing traditions began to form in the 1870s. For instance, the race began to be run on a Tuesday in 1875, and the first golden cup design of a Melbourne Cup trophy was used in 1876. Commemorative stamp for the 100th Melbourne Cup in 1960 depicting Archer, winner of the first Melbourne Cup. Throughout the early Melbourne Cup years, Etienne de Mestre was the most prominent trainer, with 5 of his horses winning from 1861 to 1878. However, he had a fierce rival in John Tait, who managed to train a Melbourne Cup winner 4 times in that same period. The Melbourne Cup continued to grow throughout the late 1800s, and it was well established as the most important race in Australia by the time Mark Twain visited in 1895 and documented the unique character of the event. By this point, none could contest how central the Melbourne Cup had become to Australian culture – possibly the first Australian tradition that no one could deny. 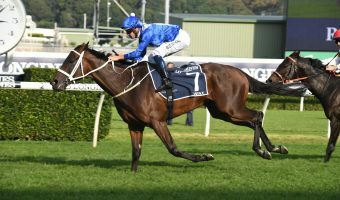 More than a century later, with the 2010 Melbourne Cup marking the 150th running of the race, there have been many legendary horses that have contested the Cup. 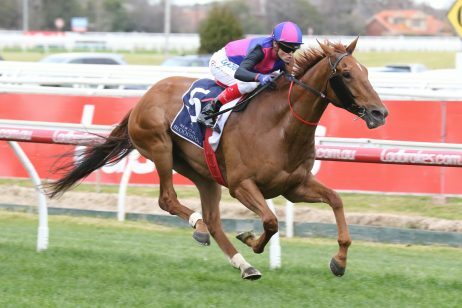 The most famous may be Phar Lap, who won in 1930, but other legends are Rain Lover, Think Big, Kingston Rule, Let’s Elope, Rogan Josh, and three-time winner Makybe Diva. Trainer Bart Cummings also belongs in any list of Melbourne Cup legends, as he has a dozen Melbourne Cup wins under his belt. If you want to learn more about the legends of the Melbourne Cup, please visit our dedicated Melbourne Cup history section. For more, please visit our Melbourne Cup facts and statistics page. Australia is a nation of punters, and that is no more apparent when it comes to 2018 Melbourne Cup betting. Whether you are a dedicated racing fanatic or not, having a bet on the Melbourne Cup field on the first Tuesday of November is an Aussie tradition. Everyone is keen to get in on the Melbourne Cup betting action on the famous Flemington Race 7 and Melbourne Cup sweeps are hugely popular. Melbourne Cup betting is open at bookmakers around the country including Ladbrokes.com.au pretty much all year round. Futures Melbourne Cup betting odds on possible runners to line-up in the Melbourne Cup barriers come race day offer generous all-in pricing, while waiting for the official field to be announced on Derby Day offers more secure Melbourne Cup betting markets. 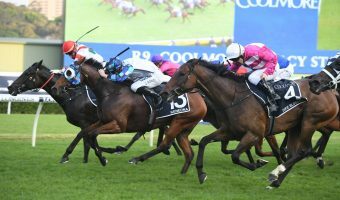 Exotic Melbourne Cup bet types like the Melbourne Cup quinella, trifecta and first four also give punters more than just the Melbourne Cup winner to invest in each spring. For a full guide on betting and exotic bets, please visit our extensive Melbourne Cup betting section. The Melbourne Cup trifecta is one of the most popular Melbourne Cup betting markets and involves picking the first three over the line in correct order in the ‘race that stops a nation’. Not only do you have to predict which horse will join the prestigious list of Melbourne Cup winners, but you also have to successfully tip which two stayers will finish second and third in the official Melbourne Cup finishing order. That’s why a Melbourne Cup Box Trifecta is a popular option because it means your three horses can finish in any order and you still win. To learn more about picking and placing a winning trifecta or box trifecta, please visit our Melbourne Cup trifecta page. Of all the exotic Melbourne Cup betting options, the quinella is the simplest. In a Melbourne Cup quinella, you must choose the first two finishers of the race, but the order they finish in does not matter. 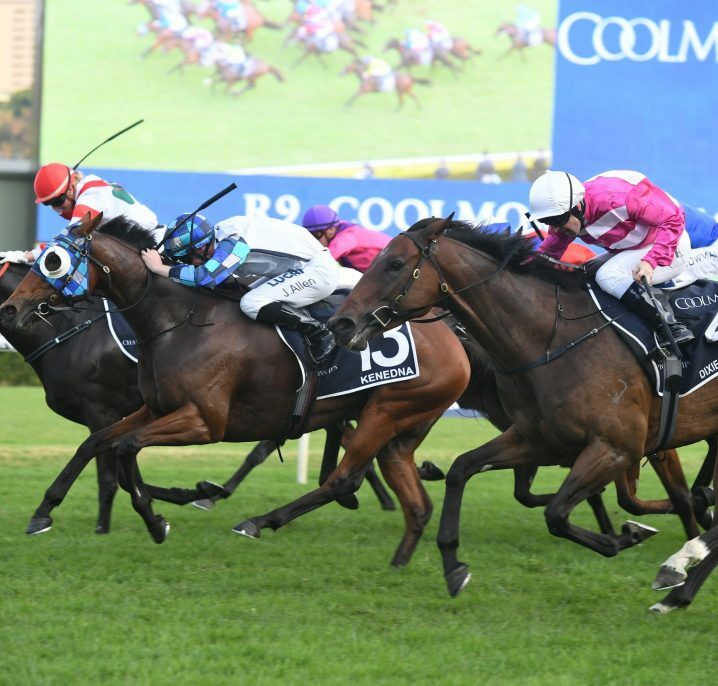 This flexibility can be very helpful when there are two strong favourites in the race, as a Melbourne Cup quinella saves you from having to decide between two great horses when the statistics suggest it is an even race. 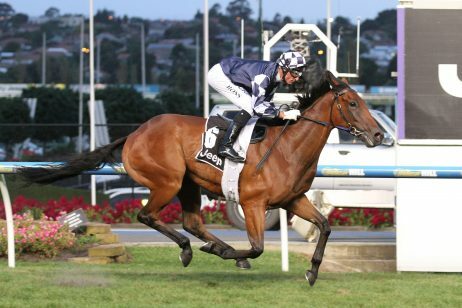 To learn all about making a winning quinella, please visit our Melbourne Cup quinella page. The Melbourne Cup exacta is a bit harder than the quinella, as it requires you to choose the first two finishers in exact order. It may seem odd that this is a popular Melbourne Cup betting option given the flexibility of the quinella, but a winning Melbourne Cup exacta pays out significantly better than a quinella. As with the other less flexible exotic Melbourne Cup bets, many punters place a box exacta to cover multiple combinations of the first two finishers. This allows you to get the flexibility of the quinella at a higher cost, but with the massive payout of a Melbourne Cup exacta. For more on placing a winning exacta, please read our Melbourne Cup exacta page. The ultimate Melbourne Cup betting challenge is to correctly pick the Melbourne Cup First Four, and boy can it pay well. In a Melbourne Cup First Four bet, you must choose the first four finishers in correct order. It goes without saying that most punters go with a boxed Melbourne Cup First Four if they take on the challenge at all. While a Melbourne Cup First Four bet pays off just extravagantly in years when the favourite wins, it will pay life changing sums of money any time a couple of outside chances finish in front. Forget 100 to 1 payouts – a correctly chosen Melbourne Cup First Four bet can payout hundreds of thousands of dollars per dollar wagered! To learn more about placing a First Four bet, visit our Melbourne Cup First Four page. The Melbourne Cup results will be known when the race runs on . Please see the Melbourne Cup Results page for all the past Melbourne Cup winners and placegetters in the two-mile classic. Horses race to the finish line. More often than not a roughie chance in Melbourne Cup betting gets up to dominate the Melbourne Cup results, including in 2015 when Prince Of Penzance ($101) saluted at triple-figures. One of the most incredible Melbourne Cup results in recent years happened in 2006 when two Japanese trained horses took the first two places. Trainer Sumii Katsuhiko had the pleasure of being the first Japanese trainer to produce a Melbourne Cup winner in Delta Blues and also picked up the quinella at the same time with his horse Pop Rock. The closest of all Melbourne Cup results was in 2011 when the French raider Dunaden only just held off Red Cadeaux in a photo finish. Ever since the beginning of the race, Melbourne Cup fashion has been a major part of the festivities at Flemington. While the focus on fashion started with women, in recent years the male attendees have been getting into Melbourne Cup fashion as well. To savvy up on the latest fashions, be sure to check out our Melbourne Cup fashion section. One of the unique aspects of 2018 Melbourne Cup fashion is the focus on hats. Melbourne Cup hats tend to be a bit more flamboyant than day-to-day headwear, and the real stylistas have their Melbourne Cup hats custom made to really make a statement. To learn more about getting your own unique hat, please visit our Melbourne Cup hats page. The most authentic Melbourne Cup fashion statement you can make is to wear a fascinator, as Melbourne Cup fascinators are one of the most striking features of the fashion scene at the Flemington Spring Carnival. You’ll want to visit a professional milliner for fascinators that really stand out, so check out our Melbourne Cup fascinators page for suggestions. Women’s race wear at the Melbourne Cup changes every year, and it pays to read up on the latest fashions before putting an outfit together. From the dress to the shoes to the hat or fascinator, our women’s race wear page tells you all you need to know to make a splash at the 2018 Melbourne Cup. Men’s race wear at the Melbourne Cup is a bit more timeless, but it is important to wear the right style and get your suit fitted properly. For tons of tips on men’s fashion for the Melbourne Cup, read our men’s race wear page. The Melbourne Cup birdcage is the premium marquee area, where socialites and business leaders rub elbows while wearing the very best Melbourne Cup fashion. To learn more about the Melbourne Cup birdcage (and how you can get in) be sure to check out our dedicated page on the Melbourne Cup birdcage. Possibly the most important part of the Fashions on the Field events is the presentation of the Melbourne Cup Design Award. Celebrating the achievements of Australia’s top race wear designers, you can learn more about the Melbourne Cup Design Award on our info page. The Flemington Spring Fashion Lunch is a major showcase of Melbourne Cup fashions, with people around Australia holding their own fashion functions when they cannot make it to Flemington or a local racecourse. To learn more about it, visit our Flemington Spring Fashion Lunch page. Aside from the celebrations at Flemington, many Melbourne Cup lunches and events are held around the country on Cup day. 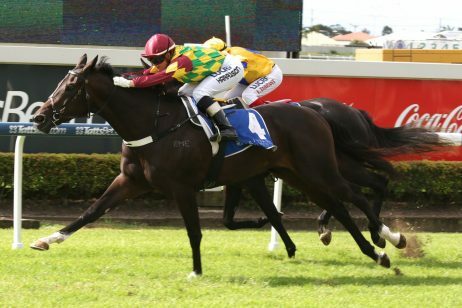 The biggest events are held at racecourses and Turf Clubs around Australia, but most people just have a catered lunch at work or turn up to the pub to watch the race. For more information on organising fun events, please visit our Melbourne Cup lunches and events page. Aside from providing accommodation, many hotels in Melbourne also offer special events to entertain visitors to Melbourne. Visit our dedicated page on hotels in Melbourne to find out about special packages for staying near Flemington during the Melbourne Cup Carnival. If you are in Melbourne and looking for a good restaurant to celebrate your Melbourne Cup winnings at, then check out our guide to Melbourne Cup restaurants! Covering many different kinds of cuisine, our guide will see you eating in style. It can be a bit tricky getting Melbourne Cup tickets, as the general admissions tend to sell out quickly once released. They also have conditions that you may not be aware of prior to purchase, as Flemington tends to keep ticketing for businesses restricted to marquees while general admissions are reserved for the public. While getting Melbourne Cup tickets can sometimes seem like more of a challenge than picking the Melbourne Cup trifecta, it is easy enough if you simply know how the ticketing system works and which ticket types are restricted to VRC members. Please visit our Melbourne Cup tickets page to find out more! Whatever you want to know about the Melbourne Cup and Melbourne Cup betting, you will be sure to find the information you need in one of our many Melbourne Cup pages. 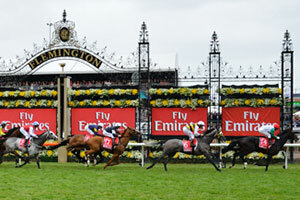 If you are simply looking for a place to bet on the Melbourne Cup, we recommend starting with Ladbrokes.com.au. Get set for the 158th running of the Melbourne Cup on the first Tuesday of November.